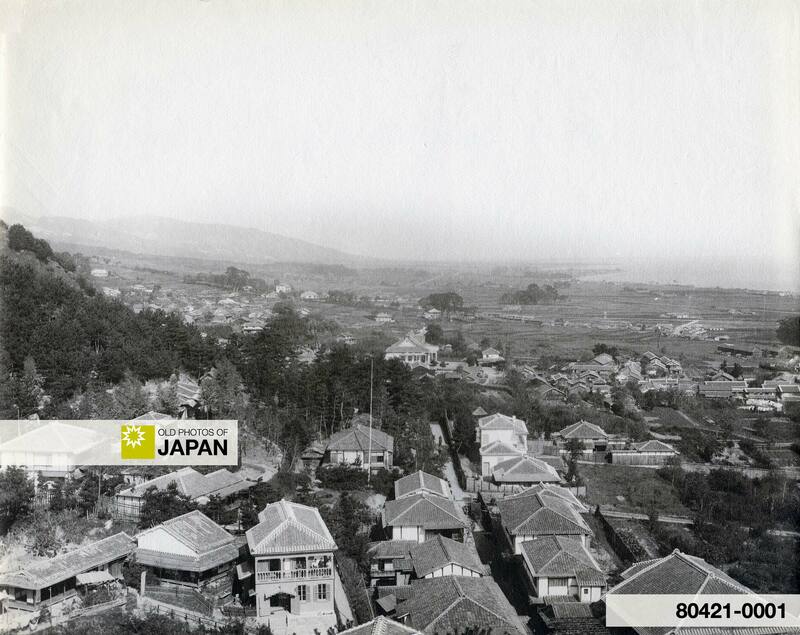 View of eastern Kobe from Mount Suwa (諏訪山) during the late 1870s, early 1880s. The foreign settlement is located on the coast just out of the frame on the right. The small grove is Jogaguchi Cemetery (城ケ口墓地). Behind it lies the residential district of Kitano-cho where later many foreigners would build beautiful Western style houses. Some of these houses still exist and the area is now a popular tourist destination known as Kitano Ijinkangai (北野町異人館街). On this image, there are still less than a handful Western style houses. The temple-like building in the center is the Jogaguchi Lecture Hall of the Jodo Sect Honganji Branch of Buddhism (浄土真宗本願寺派の城ケ口説教所, Jodo Shinshu Honganjiha Jogaguchi Sekkyosho) located at Yamamoto-dori 3-chome (山本道３町目). It was built in 1875 (Meiji 8) as a response to the popularity of Chrisitianity in Kobe. The first prefectural government meeting was held here on May 13, 1879 (Meiji 12). Just behind the lecture hall lies the road that would eventually turn into Tor Road, now a fashionable shopping street. Yamamoto-dori was not extended beyond Jogaguchi Lecture Hall until 1889 (Meiji 22), and on this image most of Kobe still looks amazingly rural. 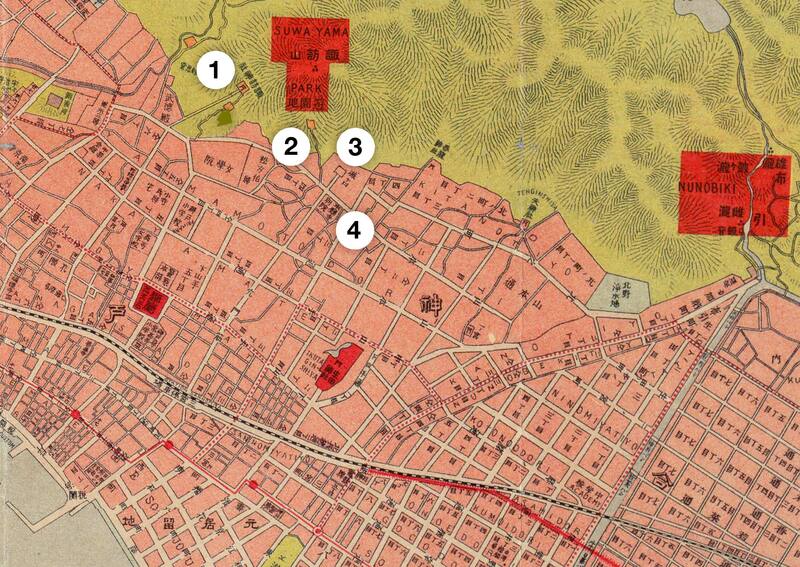 1911 (Meiji 44) Map of Kobe: 1. Suwa Jinja shrine; 2. Yamamoto-dori; 3. Jogaguchi Cemetery; 4. Jogaguchi Lecture Hall of the Jodo Sect Honganji Branch of Buddhism (this map is from a much later date than the photo, but early maps don’t have the cemetery and lecture hall marked). You can also licence this image online: 80421-0001 @ MeijiShowa.com.